Gotham Girls in Downtown Albuquerque. Concepts are not my strong suite, I primarily focus on shooting. My mind is always focused on what my setting are, is my compositions clean where are my highlights and what do I need to change in a given moment. That’s what I like about photography, that feeling of being in the moment and being able to adapt in any situation to get exactly what you want out of a given situation. Lucky enough for me I get to work with different people who can come up with concepts for me. While scrolling through my various social interwebs areas I came across a post by Jenna Lay (scene here as Catwoman) asking if anyone would be interested in shooting a Catwoman and Poison Ivy themed shoot with fellow model Taylor Hayes (Poison Ivy). This being particularly up my alley in terms of things I like to shoot I volunteered. Summer was drawing to a close and I’m never one to turn down and opportunity to shoot. 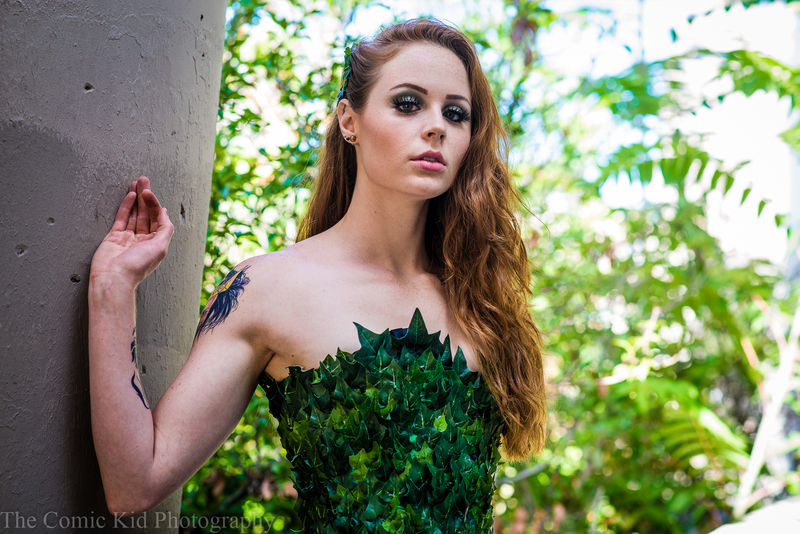 I offered up a location in Downtown Albuquerque that I had previously shot with Tara (See those Photos here) that gave the perfect mix of urban concrete and green plant life which was perfect for the characters we would be representing. It allowed us to be relatively in the same space while at the same time we could get a variety of different looks without going too far which for costume based photo shoots in public areas is a good thing. The over all shoot took less than an hour and didn’t require much gear. Really it was just my standard body and lens set up and me just keeping and eye on my exposure the whole time. The more and more I shoot the more I can see some of my personal style points becoming drastically prevalent. Especially when I shoot models I want my subject to fill the frame. Props and backdrops should be exactly that back drops. Having the subjects as a the main focus makes it easier for the audience know what they’re supposed to be seeing and not getting distracted by something that draws the eye away. Visually I’m trying to get the sharp areas sharp and the areas that don’t matter soft and bokeh-ee. It’s primarily the reason why I’ve gotten away from using the skin softening brush, I’ve fallen in love with getting a rich level of detail in people’s faces and all that the skin softening tool really does is dull out yours images and make them look like those terrifying dolls your sister had as a kid. In editing (where the photos come together) I have also come up with a certain style. If anything it amounts to fine tuning of images in lightroom. Adding contrast, pulling shadows, dropping highlights getting exposure balanced out and doing very little to almost no changes to the physical image. I come from a photojournalist background and I refuse to mess with the physical elements of an image. For portraiture I will make some compromises like healing out obvious blemishes and making some changes on request to color especially when wardrobe doesn’t match. But other than that I try to keep the physical space untouched but that’s just me. Some people may not share my same sentiment when it comes to editing and think that’s okay but that’s not what I want to do to my images and I think they are better off that way.